The Fiscal Responsibility and Budget Management Bill, 2000 was introduced in the Lok Sabha by the then Finance Minister of India, Mr. Yashwant Sinha under the then National Democratic Alliance Government led by Mr. Atal Bihari Vajpayee. The prime purpose of this bill was to control the fiscal deficit both at the centre and at the level of the states through prudent utilization of the public funds and ultimately bringing fiscal deficit of the country within a limit of 3% of the Gross Domestic Product (GDP) and revenue deficit to zero levels by March 2006. The bill had been a slow mover since the beginning. The bill was introduced in the Parliament in December 2000 but it was passed by the Parliament on August 26, 2003. 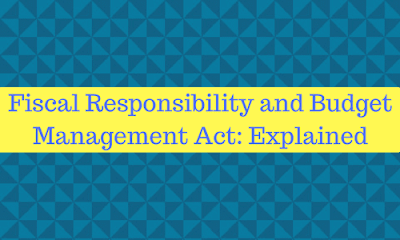 Although it got the assent of the then President APJ Abdul Kalam on the very same day, yet the Fiscal Responsibility and Budget Management Act, 2003 (FRBM) was implemented w.e.f. 5th June, 2004 after official gazette notification by the United Progressive Alliance Government led by S. Manmohan Singh as Prime Minister. In view of the international financial crisis originating in the USA under the leadership of Mr. Barack Obama, the target implementation date was initially postponed by one year to March 2008 and then again to March 2009 and ultimately the Act was suspended in 2009 by a cabinet decision taken by Manmohan Singh Government. Brining down the revenue deficit to zero levels through reduction in the same @ 0.5% per annum and bringing down the fiscal deficit to 3% through reduction in the same @ 0.3% per annum. Aggregate liabilities of the Union Government must not exceed 9% of the GDP and its guarantees to the loans raised by the State Governments and Public Sector Undertakings must not exceed 0.5% of the GDP. Under the existing NDA Government, the Union Finance Minister Arun Jaitley announced during the presentation of 2016-17 annual budget; the setting up of a five-member Committee to review the FRBM Act. The Committee was formed in May 2016 headed by former M.P. and former Revenue and Expenditure Secretary NK Singh and the Committee was named N.K. Singh Committee. The other four members of this committee were Chief Economic Advisor to the Union Finance Ministry Arvind Subramanian, former Finance Secretary Sumit Bose, the then Deputy Governor of the Reserve Bank of India Urjit Patel (now Governor) and The National Institute of Public Finance and Policy (NIPFP) Director Rathin Roy. NK Singh Committee submitted its report to the Finance Minister on 23 January, 2017. Among the main recommendations of this Committee are a fiscal deficit within the ceiling of 2.5 per cent of the GDP, revenue deficit of 0.8 per cent and a combined Centre-state debt ceiling of 60 per cent by 2022-23 i.e. within a span of six years from now. Union Finance Ministry has sought feedback from the general public till May 5, 2017 and after the approval of the Union Finance Ministry and after being passed by the Union Cabinet, these recommendations will form the amendment to the now suspended FRBM Act and after having been passed by the Lok Sabha (Since it is a Money Matter motion, it need not be passed by the Rajya Sabha – only the presentation in Rajya Sabha is required), and after receiving the assent of the President of India, a fresh FRBM Act, 2017 may see the light of the day during the next session of the Parliament.